Summer wrote a story earlier this school year and we entered her story in a contest called "PTA Reflections". She won 1st place in the local contest and then her story was sent to the state competition. She did not win at state, but we are very proud of her hard work. She is a very good writer for a 2nd grader and we know that her talent will only improve as she grows. 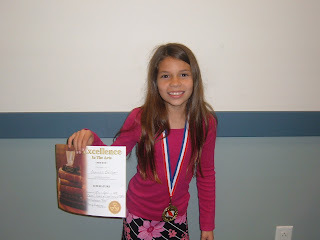 Here is a picture of her with her medal and certificate. very cool! congrats, summer! do we get to read the story? Congratulations, Summer! You should put the story on the blog. I know there are quite a few people that would love to read it.